A group of billionaires, old-line political movers and shakers, and influential advocates released their recommendations Monday for changing the state's tax structure to increase state revenues by $10 billion a year, with half of that going to K-12 schools and community colleges and another $2.5 billion for the University of California and California State University. 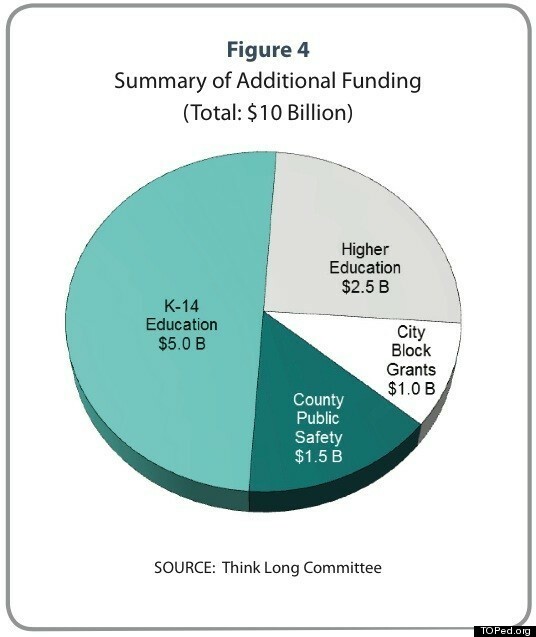 The Think Long Committee for California, chaired by Nicolas Berggruen, founder and president of Berggruen Holdings, intends to place two initiatives on the 2012 ballot to overhaul the state's tax and finance structures, and to amend the school funding law, Proposition 98. The proposals, explained in the committee's 24-page report, A Blueprint to Renew California, seek to get the state out of debt by reducing personal income taxes at every level, cutting corporate taxes, and reducing sales taxes for consumer goods while extending them at a higher rate for services like haircuts, accounting, and car repairs. "Nearly one-half of California's $2 trillion economy is composed of services - none of it taxed," wrote Berggruen and Nathan Gardels, an adviser to the Think Long Committee, in an OpEd piece in Sunday's Sacramento Bee. "If you eat a doughnut in a coffee shop, the sales tax on goods applies. If you use a legal or financial service, it is not taxed. In other words, the doughnut subsidizes lawyers, accountants, and other services." Similar ideas have been kicking around for years. In early 2009, Gov. Schwarzenegger established the Commission on the 21st Century Economy, which also proposed tax code changes to stabilize the state's revenue. That commission, which was chaired by Gerald Parsky, now a member of the Think Long Committee, failed to get any traction in the state legislature. After that, the $5 billion becomes an additional permanent source of discretionary funds for schools that is not subject to the fluctuations of state revenues, according to Tim Gage, a consultant to the committee. However, it doesn't get folded into Proposition 98, which would raise the base amount due to schools. But there is a caveat. In exchange for the annual $5 billion, the state would never have to repay as much as $14 billion in maintenance fees; that's the gap in funding that occurs during recessions or other economic downturns, when Prop 98 is either suspended or reduced. Schools are currently first in line to get that money restored when the economy improves. John Mockler, a former executive director of the State Board of Education and the author of Prop 98, said he supports some of the recommendations, but he could barely contain his anger at that part of the plan, which he described as arrogant and likened to a form of extortion. "Somebody borrows money from you; they borrow $100 and they come and say, 'I know I owe you $100, here's $4, but first you have to change your hairstyle, lose a little weight, and tune up your car.' Excuse me, you have a legal debt, a constitutional debt created by two constitutional amendments," said Mockler. The California Teachers Association slammed much of the Blueprint, calling the Think Long Committee "out of touch with California voters and their commitment to fund public education," based on some recent polls. "Rather than help public schools recover from the billions they have lost, the committee ties future funding increases to unproven education reforms. This is taking the state in the wrong direction," said CTA president Dean Vogel. But Gage insists that it's a good deal for schools because they'll get the $5 billion a lot sooner than if they had to wait for state revenues to increase enough to recoup the maintenance factor funds. What's more, he said, "This money would be available as discretionary revenues to be used for any school purpose." Since members of the Think Long Committee were not appointed by any government agency and have no ties to special interest groups, they weren't beholden to any point of view and reached consensus on all the proposed recommendations, wrote Berggruen in theSacramento Bee article. "The ideologically rigid will have a hard time putting the Think Long proposal in any box," wrote Berggruen. "We came together only as an independent group of concerned citizens who believe in California's promise and who want to get the state back on the right track." *Complete list of members: Nicolas Berggruen, David Bonderman, Eli Broad, Willie Brown, Gray Davis, Maria Elena Durazo, Matthew Fong (the former State Treasurer died June 1, 2011), Ronald George, Antonia Hernandez, Robert Hertzberg, Gerry Parsky, Condoleeza Rice, Eric Schmidt, Terry Semel, George Shultz, and Laura D'Andrea Tyson. Kathryn Baron is a co-writer of TOPed.org, a blog on California education policy. Read more of her work and more at www.toped.org.